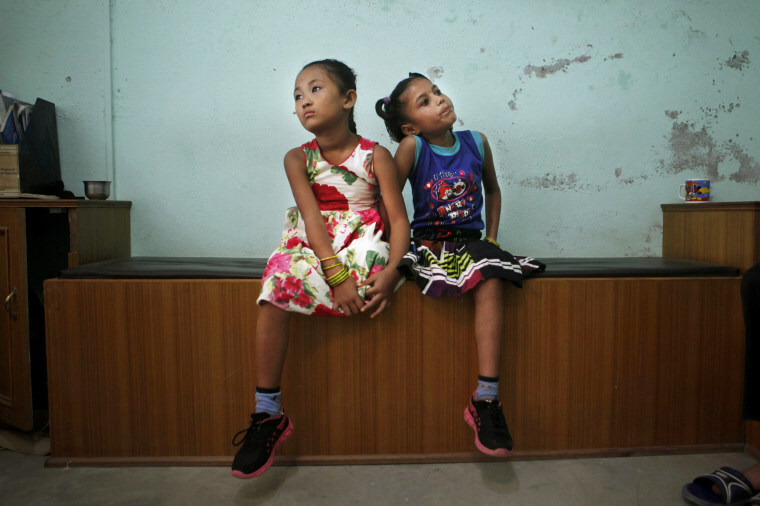 Two girls who each lost a leg in last year's Nepal earthquake became best friends at a hospital in Kathmandu. Khendo Tamang, left, and Nirmala Pariyar, both 8, play on a mobile phone at the Bir Trauma Center in Kathmandu, Nepal, on July 6, 2015. Each girl lost one leg in Nepal's massive April 25, 2015 earthquake that killed nearly 9,000 people and left more than 22,000 injured. 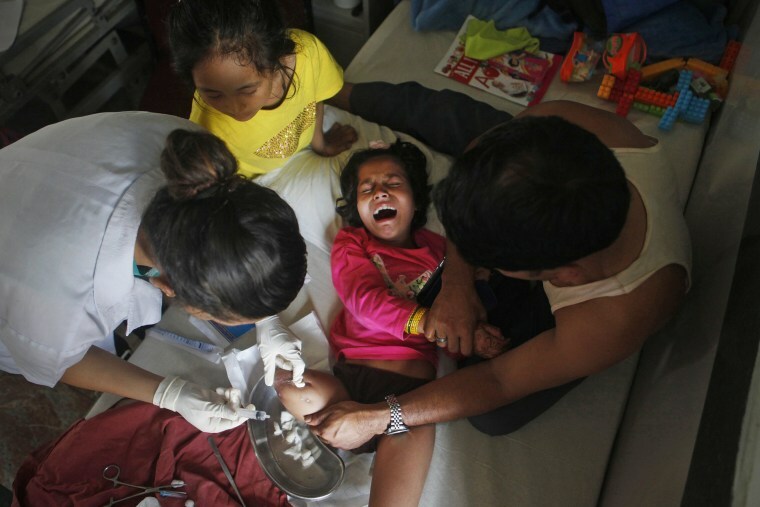 Khendo Tamang, in yellow, stands by the bedside of her best friend Nirmala Pariyar as she cries in pain during treatment on her amputated right leg at the Bir Trauma Center. The earthquake brought the two girls together, putting them in the same ward at Kathmandu's Bir Hospital. Both were 7 years old at the time. The first months after amputation were often difficult for both girls. There were surgeries to clean their wounds, therapy to get them moving again and prostheses, built with the help of the aid group Handicap International, to be fitted. But Nirmala's normally relentless cheeriness eventually re-emerged, and one day she found Khendo in another part of the hospital ward. Khendo was still badly depressed, crying and barely talking. Friendship, though, began pulling Khendo out of her despair, and soon the two girls were inseparable. Khendo Tamang, left, and Nirmala Pariyar share a pair of shoes as they wait to be measured for new prosthetic legs in Kathmandu on Sept. 8, 2015. At first, the girls spoke no common language — Nirmala speaks only Nepali, the country's main language, and Khendo initially could converse only in Tamang, the language of a Buddhist minority — but their friendship was immediate and absolute. They whispered secrets, learned to walk again and often fell asleep in the same bed. 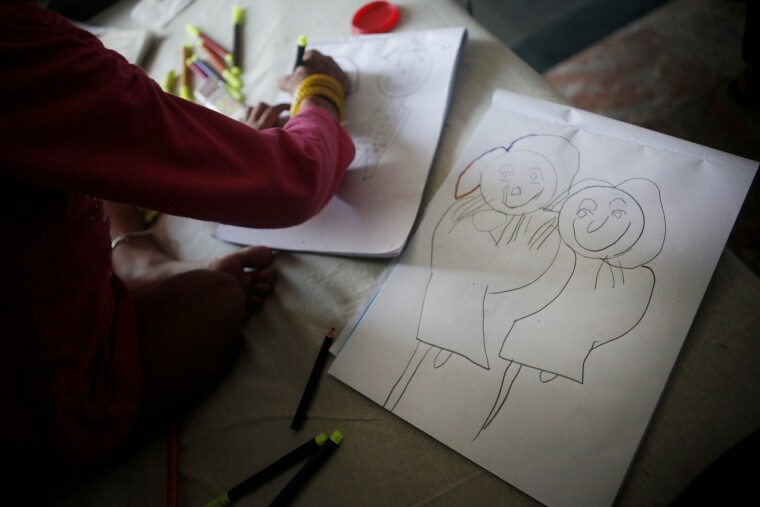 Nirmala Pariyar draws pictures of herself and her friend Khendo Tamang at the Bir Trauma Center in Kathmandu on July 24, 2015. 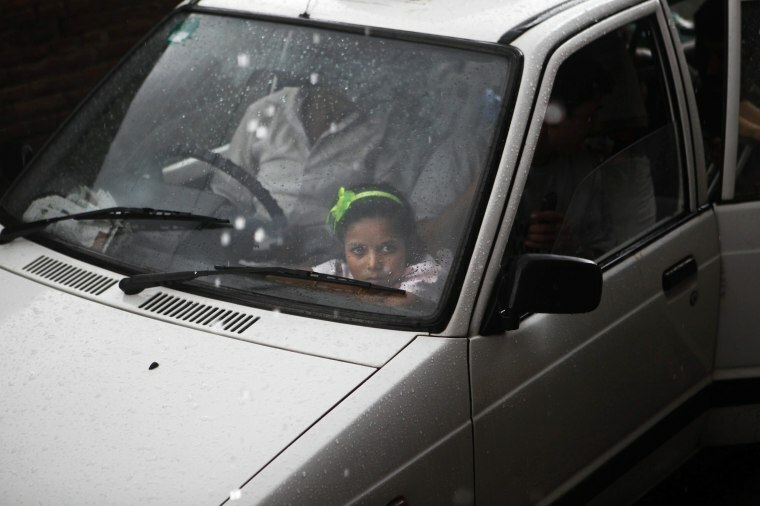 Nirmala Pariyar looks out a car window after her best friend Khendo was dropped off at a relative's house on Aug. 19, 2015. 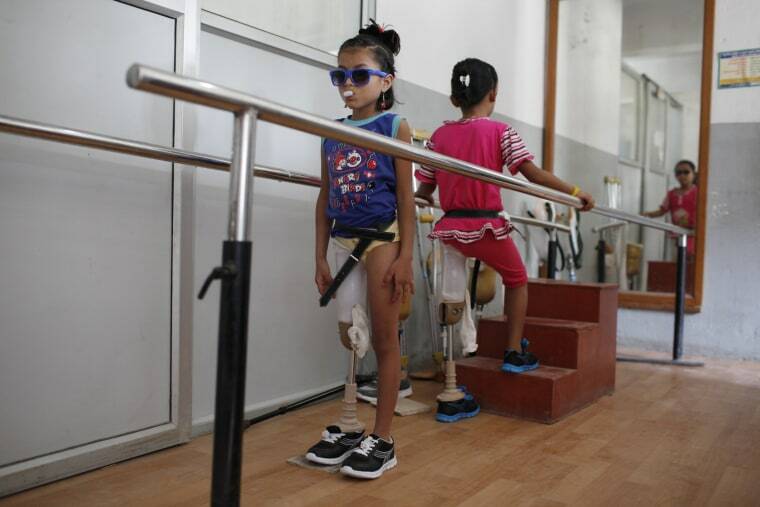 Nirmala Pariyar and Khendo Tamang practice walking with new prosthetic legs at a clinic in Kathmandu on Oct. 16, 2015. Though the earthquake brought them together, their futures appear headed in very different directions. Khendo had a stroke of luck that could change her life: A foreign traveler who stumbled across her when she was badly injured is now paying to send her to a private school in Kathmandu. Nirmala did not. Her father earns less than $3 a day sewing the loose-fitting hippyish clothes so popular among Western travelers. Khendo Tamang walks with the assistance of her mother Yagnsen and family friend Chitra Bahadur after receiving a new prosthesis on Oct. 16, 2015. 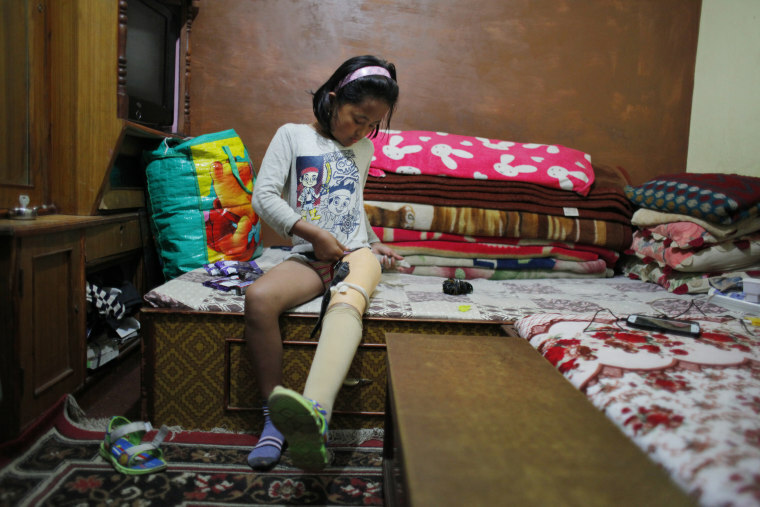 Khendo Tamang adjusts her prosthetic leg in Kathmandu on March 9, 2016. 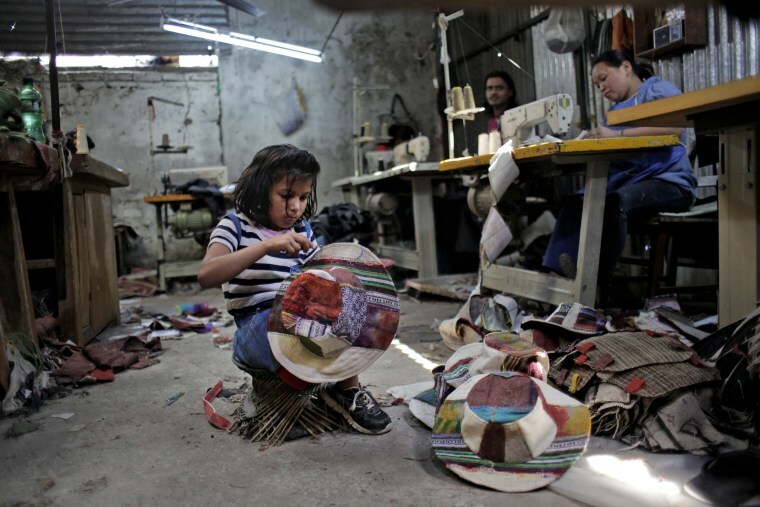 Nirmala Pariyar, 8, helps her father at a textile factory in Kathmandu on March 25, 2016. Nirmala lives with her parents in a room of a small textile factory where her father works in Kathmandu. He left their farming village years ago to come to the capital to earn more money. Nirmala's parents are desperate to find financial support to put her in school. But held back by their own illiteracy, they have no idea where to turn. All they know is she can no longer navigate the village paths to the school there, and only a private school would have the dormitory facilities so she could stay in the capital. That means tuition bills they simply cannot afford. Khendo Tamang and Nirmala Pariyar share a single pair of shoes at the Bir Trauma Center in Kathmandu on July 15, 2015.